A new and novel concept, village tourism gives you the opportunity to discover the true spirit of Nepal. 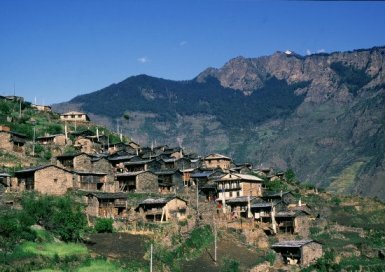 The experience of staying in an unspoiled village with a host family is not just quaint and unique, but also gives you a rare opportunity to know the locals and their culture. A village stay with your host family will not give you five star luxury. But what you will get is the warmth of Nepali hospitality, and the experience of living the life of a Nepali villager. The accommodation is simple, but comfortable. You will get comfortable bedding and clean toilet facilities with running water. The food is the typical Nepali fare of rice, lentils and garden fresh, organically grown vegetables, with a non-vegetarian dish thrown in at times. And though you won't get hot-showers, television, bottled beers and hamburgers, you'll be so engrossed in the village life that you won't even miss them. You can participate in the traditional dances in the evening. Visit and study the local temples or monasteries, and trek or hike to the surrounding mountains. You could even do something as simple yet enriching as walking around with your host family as they go about their daily chores, tending animals, tilling fields, going to school... or simply sit and chat with the villagers. You can also partake the botanical tours or visit the local ayurvedic/medicinal plant nurseries. If you are interested in a visit to a Nepalese village email me with the dates you had in mind here.